New Delhi : After taking an unassailable 1-0 lead, India will aim to clinch the three-match Test series against Sri Lanka at a typical five-day pitch of the Ferozeshah Kotla Cricket Ground here on Saturday. 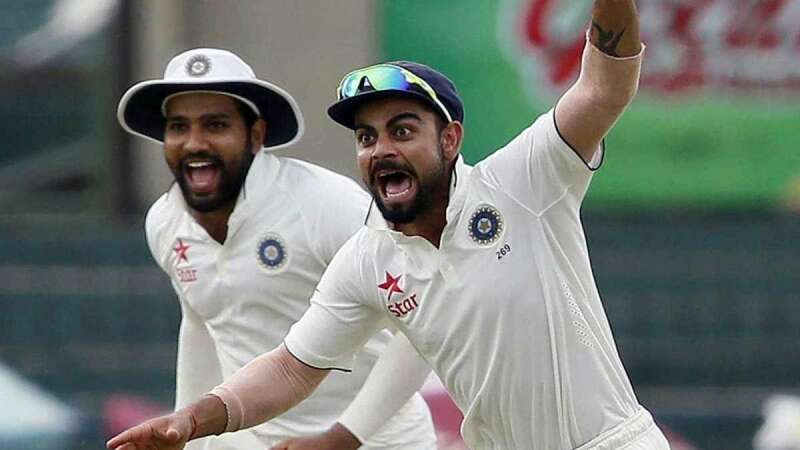 India will also eye on equalling a record of most consecutive Test series wins. Currently, they are on an eight-series winning streak and a win or a draw in Kotla will pull them level to the record which is jointly shared by Australia and England. The ongoing Test series initiated by India, Sri Lanka registering a draw in the rain-marred first match. Later, in the second game, the hosts thumped visitors to clinch victory by a mammoth innings and 239 runs. Four Indians -- Virat Kohli, Murali Vijay, Cheteshwar Pujara and Rohit Sharma had scored in excess of 100 to once again showing their might as they exposed the toothless and ineffective bowling attack of the visitors. On a pitch that was batting-friendly, India backed up their batting firepower with their bowlers flooring the Sri Lankan batsmen as well. The Kotla wicket might offer a traditional display of Test cricket with the pitch sustaining the wear and tear over the five days. India will bank on in-form batsmen Murali Vijay, Cheteshwar Pujara, Rohit Sharma and skipper Virat Kohli who have looked to be on top of their game to get the side to a dominant start. Batsmen Lokesh Rahul, Ajinkya Rahane who have failed to click in the series will look to get going adding further depth and reliability to their batting attack. Kohli-might also fancy making changes in his top order and bring in Shikhar Dhawan to play at his home turf. It will be interesting to see whether captain Kohli returns to his old composition of fielding five batsmen, five bowlers and a wicket-keeper. He had fielded four bowlers in the Nagpur Test and all of them delivered. If he goes for the four-bowler composition, he may have a difficult decision to leave out home boy and pacer Ishant Sharma, who bagged five wickets in his comeback Test in Nagpur, in favour of the returning Mohammed Shami. The Kolkata pacer had missed the second Test due to a hamstring problem. Star spin pair of Ravindra Jadeja and Ravichandran Ashwin will for the first couple of days aim to contain runs before turning the heat thereon. The Dinesh Chandimal-led visitors will however look to re-work on their strategies to level series. In batting, Sri Lanka will rely on experienced campaigners in form of Lahiru Thirimanne, Angelo Mathews, Chandimal and Niroshan Dickwella, who have failed to play match winning knocks in the ongoing series to give their side a much required dominating start. The visiting batsmen are lacking in concentration and patience which are of prime importance in Test cricket. They lack the experience of playing long innings. Without taking the credit away from the Indian bowlers, it is also the case of the Sri Lankan batsmen gifting their wickets away. Sri Lanka off-spinner Dilruwan Perera who has looked to cause trouble to the Indian batsmen will be the key in the bowling department. Their side will also hope bowlers Suranga Lakmal, Dasun Shanaka, Lahiru Gamage to scalp vital blows. However, the visitors bowlers who have conceded plenty of runs in the series will look to find rhythm in order to surprise the Indian batsmen and level the series. India: Lokesh Rahul, Murali Vijay, Cheteshwar Pujara, Virat Kohli(captain), Ajinkya Rahane, Rohit Sharma, Ravichandran Ashwin, Wriddhiman Saha (wicket-keeper), Ravindra Jadeja, Umesh Yadav, Ishant Sharma, Kuldeep Yadav, Mohammed Shami, Vijay Shankar, Shikhar Dhawan. Sri Lanka: Sadeera Samarawickrama, Dimuth Karunaratne, Lahiru Thirimanne, Angelo Mathews, Dinesh Chandimal(captain), Niroshan Dickwella (wicket-keeper), Dasun Shanaka, Dilruwan Perera, Jeffrey Vandersay, Suranga Lakmal, Lahiru Gamage, Dhananjaya de Silva, Lakshan Sandakan, Vishwa Fernando, Roshen Silva.